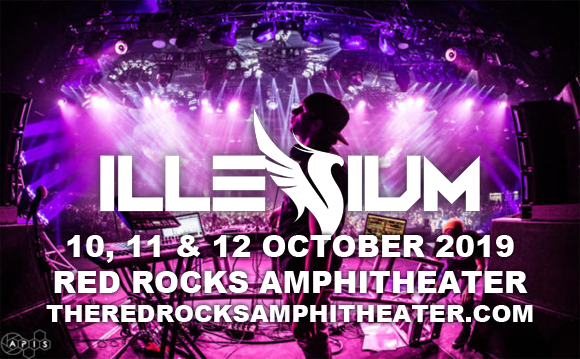 Illenium returns to Red Rocks Amphitheater on Friday 11th October 2019 for the second in his three-night-stand! The EDM sensation's back-to-back shows will see him dropping some killer tunes, like his recent hit "Pray", as well as stellar remixes, plus all-new material from his hotly anticipated upcoming album! Think fast – we won't have tickets for long! American musician, DJ and producer Illenium is best known for his 2016 remix of "Don't Let Me Down" by The Chainsmokers. He made his debut in 2013 with the release of his self-titled EP, and followed with two more EPs – Risen (2014) and Painted White (2015) – before releasing his debut studio album, Ashes, in February 2016. The album peaked at number 6 on the Billboard Dance/Electronic Albums chart and at number 19 on the Billboard Top Heatseekers chart. His follow-up album, Awake (2017), charted on the Billboard 200 and peaked at number 3 on the Billboard Dance/Electronic Albums chart and number 7 on the Billboard Top Heatseekers chart. Illenium has also released remix albums of both his first and second LPs. His latest release is the single "Pray" featuring Kameron Alexander.